Finding the best RV fresh water hose may not be the highest of priorities for most RV owners. However, in our opinion, the RV fresh water hose is one of the key pieces to a pain-free camping experience. It will be abused by the sun, hot temperatures, cold temperatures, constant water pressure, and more. 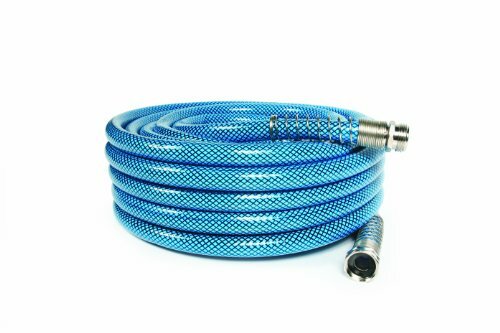 This review is for any RV owner that is looking for a new RV fresh water hose. This may mean that you recently purchased a new RV (congratulations! ), or you are replacing a broken fresh water hose. You may be a weekender looking for a good fresh water hose for your vacations or a full-timer looking for something that will last week-after-week. In any case, our pick will work for you. The perfect fresh water hose is a trusted companion for all RV owners, full-time or weekender. This is one category where the right choice can alleviate any headaches on the road. To help you find that perfect fresh water hose, we looked at 20+ models and bought the best for detailed testing. We used them in hot, moderate and cold climates. This heavy duty fresh water hose is built to stand the test of time. It has nickel plated brass ends that resist corrosion and strain-relief springs to help keep the ends protected where they receive the brunt of normal wear and tear. The 6-pound hose is thicker than an average hose and you can definitely feel it. The durable exterior will keep the hose protected from most rips or punctures but also has a downside, it's not very flexible. The extra thickness of the hose does have another benefit though, it provides a little extra insulation of the hose. This means that your water will stay colder in the summer and warmer in the winter. This is not an insulated hose so should not be used if it is going to be below freezing outside. However, it is rated to be used with liquids up to 180 degrees Fahrenheit. It has an extra UV coating to resist the hose breaking down as it sits in the sun day after day. The most important benefit of this hose is that it contains no dangerous chemicals (like lead) and imparts NO off tastes. We recommend the 35ft or 50ft hose because you never know how far you will be from the fresh water spigot and moving your RV after you already unhitched is a real bummer. The only con with this hose is that it can get a little stiff after a few months. We have found that running a little hot water through it softens it up nicely. 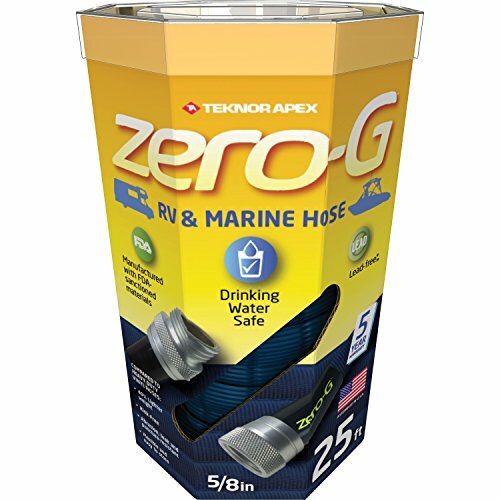 The Teknor Apex Zero-G fresh water hose is the perfect pick if you are looking to save weight. It comes in at only 2.4 pounds which more than half the weight of our number one pick. The flexibility of this hose also allows for various storage options other than the normal coil (which is actually hard to do with this hose because of its flexibility). This hose doesn't do as well as our number one pick when it comes to standard insulation so your water will more closely match the temperature outside. The durable exterior netting protecting the hose prevents rips and abrasions during normal use. This is a great hose if you are looking to save on weight. The major reasons this hose did not make our number one spot was the cost. It is more expensive than our top pick for less length. Also, other reviewers have also noted a plastic taste when the hose is left in the sun but we never experienced it.